There are many ways to spruce up an outdoor living area for both residential and commercial spaces in the greater Vancouver, WA area. 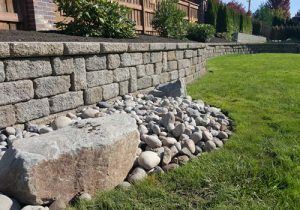 Hardscape is landscaping for an outdoor space that includes paved areas, walkways, retaining walls, brick and stone installation, and other features that are solid in nature. For many, landscaping is not completed without carefully placed hardscape design. One of the most popular hardscape features today are expert patio designs. Patio design is highly sought after as it has the potential to completely alter your outdoor living area for the better. A meticulously designed patio will make you feel as if you have traveled to another place. Depending on your personal preferences, an outdoor patio area can encompass many different things as it can be simple and delicate, or extravagant and exotic. If you can envision it, Boulder Falls can create it! Below are just a few of Boulder Falls most popular hardscaping options. Don’t see what you have in mind? No problem. Customer satisfaction is our top priority, if you can dream it, we want to help make it happen. When you choose Boulder Falls for your new hardscape project, you will get a team of professionals eager to satisfy your needs. We will do our best to give you exactly what you envisioned, as your satisfaction is always our top priority. Every new hardscape design project begins with a comprehensive consultation and evaluation of the space. For more information on hardscape design or to schedule a free no obligation consultation, call Boulder Falls today! Also, serving the needs of those in the greater Vancouver, WA and surrounding areas.